On the 26th (Sun), take in the spiritual surroundings of Enchey Monastery. Get ready for a full day of sightseeing on the next day: contemplate the waterfront views at Tsongmo Lake, then make a trip to Baba Harbhajan Singh Mandir, and then steep yourself in history at Nathula Pass. To find ratings, photos, where to stay, and more tourist information, read our Gangtok trip itinerary website . Pune to Gangtok is an approximately 7.5-hour combination of flight and taxi. You can also do a combination of train, flight, and taxi; or drive. Wrap up your sightseeing on the 28th (Tue) early enough to drive to Darjeeling. Start off your visit on the 29th (Wed): explore and take pictures at Happy Valley Tea Estate, then learn about wildlife with up-close encounters at Padmaja Naidu Himalayan Zoological Park, then see the interesting displays at Himalayan Mountaineering Institute, and finally appreciate the extensive heritage of Chowrasta. Get ready for a full day of sightseeing on the next day: contemplate in the serene atmosphere at Japanese Peace Pagoda, then make a trip to Batasia Loop, then contemplate in the serene atmosphere at Guru Sakya Monastery, and finally take some stellar pictures from Tiger Hill. For maps, reviews, other places to visit, and more tourist information, refer to the Darjeeling itinerary planner . Getting from Gangtok to Darjeeling by car takes about 2 hours. 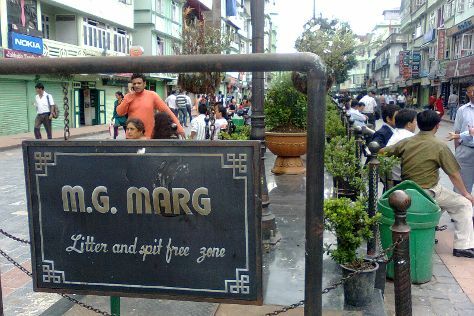 In May, daytime highs in Darjeeling are 38°C, while nighttime lows are 26°C. Finish your sightseeing early on the 30th (Thu) to allow enough time to travel back home.